Home Throwback Thursday	Custom Touches for Your Wedding! Happy Wednesday! Is it finally Spring?? On this sunny day I thought I’d share with you a few ideas we used at my son’s wedding last November as well as some very old throw backs from 34 and 60 years ago! This one is all about custom touches for your wedding! As you may recall, our oldest son got married last November. I can’t believe it’s already 5 months ago! I mean, we spent nearly a year thinking of it and planning for it and it goes by so quickly! But the good thing about having a long time to prepare is to collect your thoughts and go ahead and order custom items well in advance. This will not only save you time and money (and no expedited shipping costs) but it’s one more thing you can check off the list and not worry about at the last minute. Our families had several events leading up to the wedding such as an engagement party, a bridal shower, and of course the rehearsal dinner, the wedding and reception and finally a post wedding brunch the following day. Trust me, it was a busy year! Here are a few things we ordered for the engagement party starting with the invitations. We ordered these from Zazzle. If you get on their email list, they will send you updates and sales. If you are lucky, you can score invitations, napkins and stickers for as much as 40-50% off! We ordered about 100 of these plastic cups for drinks and a toast at the engagement party. The are the size of a high ball glass and were the perfect size for a serving of wine or mixed drink. Also, because the party was outdoors, we prefer to use plastic anytime we are near the lake. Aren’t they sweet? To commemorate each event we ordered invitations and custom napkins. We used a combination of items Zazzle, Beau Coup and Minted. These were the napkins we ordered for the Paris themed bridal shower for my daughter-in-law. What could be prettier than the Eiffel Tower, a chandelier and flowers? My son and daughter in law commissioned a local artisan in Hoboken, NJ to make their beautiful wedding invitations. They ordered matching envelopes, thank you notes and stickers. My sister ordered these stamps for the bridal shower invitations from Zazzle. She used a picture I took at the engagement party. It’s one of my favorites! My husband and I ordered a bunch of these stemless wine glasses for the rehearsal dinner. We had them sitting at each seat for a champagne toast to the couple. After the dinner the guests got to take home a glass as a keepsake. And finally for the wedding reception, we ordered these pretty cocktail napkins for the cocktail hour and the bar at the reception. Gold was their accent color so we had them printed in a pretty scroll pattern with their names and the date. And just to prove that custom napkins have been around for a long time, here is a napkin from my wedding 34 years ago! And 60 years ago from my parent’s wedding! We just celebrated this milestone in January with a big bash at my brother’s house. My Mother gave us each one of these napkins to keep. 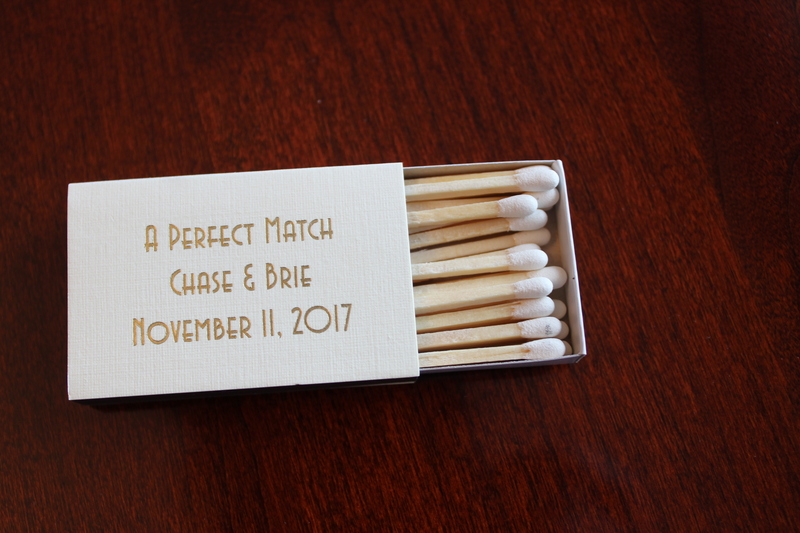 So, in order to pass along the good fortune of a long and happy marriage to our children, we ordered matches for their wedding too! I love how the tips of the matches are white. These were a sweet and finishing touch. And a perfect way to light the sparklers for the post reception send off! Ahhhh…. These are just a few of the ideas we used for my son and daughter in law’s engagement and wedding festivities. They kept a few of each as a souvenir in a scrapbook. Now we have my niece’s wedding to look forward to this fall. And the family keeps growing and growing! We are so blessed.